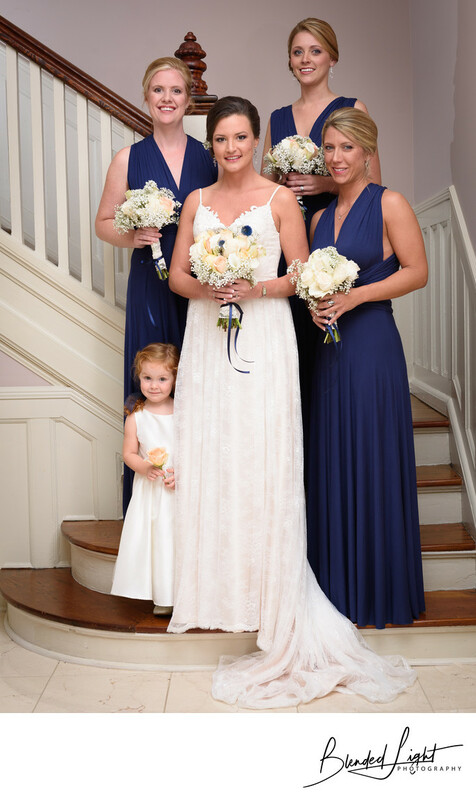 A gorgeous bride with her beautiful bridesmaids and lovely flower girl deserves a great formal shot. This is one of those images. The bride had requested that we use these steps in some of the formal images. The challenge was lighting. The stairs were too fair away from the front door to use natural lighting and doing so would have rendered the background into darkness. On the other hand, the overhead lighting was far too weak to provide ample illumination for the group as it was high on the ceilings and relatively weak in keeping with the historic nature of Lions Gate Inn in historic Wake Forest. This is a great example of your wedding photographer understanding flash and using it correctly. There are two parts to this image - the background and the bridal party. First, I chose to get the background lit properly by placing a flash on the steps to the left with the head angled up slightly at a low power. This allowed the light to bounce around naturally with the step's casing keeping the light from coming forward to the group. Once, that was done, a second flash, also on the left was put into place to light the bridal party. I love that shadows here are very soft and almost indistinguishable, with the use of flash looking completely natural. Without a knowledge of flash, many photographers would not have been able to get this image with the beauty and detail at which it was captured. Of course, it was exactly what my Raleigh bride pictured it being and she was thrilled with the results! Location: Lions Gate Inn, 238 N Main St, Wake Forest, NC 27587. 1/160; f/4.5; ISO 640; 48.0 mm.